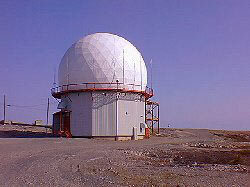 Pine Tree Radar Site is one of the three warning systems that was selected when NORAD decided to select sites and build a number of Aircraft Control and Warning Stations. Stretching from Greenland to the arctic, and along the eastern sea-board, these systems would provide the northern hemisphere with a necessary air umbrella. The other two warning systems were the DEW line and the Mid Canada Line that ran right through the centre of Canada. However, when the 64th Air Division took over the Northeast Air Command in 1960 they determined that there were gaps in the warning systems. Therefore, smaller AC&W sites, called Gap Fillers, were built along the Labrador coast and in Newfoundland. 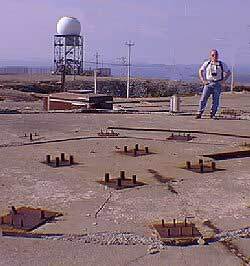 Sites for all the AC&W stations had to be on the highest altitude possible in the given location. This was to eliminate any type of surface interference with the delicate and sophisticated radar equipment. Each station had a fair-sized acreage and all permanent buildings had to be constructed. Those in the far north required the capabilities to operate in more than extreme cold conditions. Because of their elevation, each station was subject to severe winds, excessive snow accumulation and extreme low temperatures. It was necessary to include such structures as dormitories, shops, warehouses, dining halls and recreational buildings, as well as the operations centre at Pine Tree Radar Site. Some had to have interconnecting tunnels, or above-ground interconnections, between buildings. Although most of the large stations had an air force base nearby for logistical support, each facility was more, or less, on its own. Each of the various buildings were used daily to provide necessary facilities to every worker. Entertainment was the main highlight of Pine Tree. There were dances, celebrations, band performances, and lots of people in clubs as well as the Mess Hall. Every building was important in making Pine Tree a Community within itself. Life at the site was somewhat hectic at times, but quite enjoyable at others. Each day workers followed strict rules regarding the restricted areas that were top secret and making sure that everything was under perfect control. "Sometimes jobs such as these could get boring and I would often find myself playing little tunes on my ole' harmonica," says Larry Smith, former non-commissioned officer of Pine Tree. "However, I soon learned my lesson of that and stuck to the task at hand." There were workers for every area of the site possible and certainly no shortage of jobs. Maintenance workers as well as electricians who did work in the power plant were extremely important in keeping the station up and running as well as fixing and refueling equipment. Of course other jobs such as cooks, office and store workers, and those who worked with other services like entertainment were just as important. However, weather was often an obstacle that could possibly stand in the way of each workers schedule going ahead as planned. Often snow storms prevented people from traveling to and from Pine Tree. Shift-workers would have to remain at the bottom of the hill until communication with the present workers stated otherwise. If chances were taken, accidents could result in injury and even death. "Intense cold and severe winds combined to hamper operations and maintenance as well as cause destruction. Magnetic variables in this area made compasses unreliable, thus navigation problems were complex." Such an incident occurred years ago when a wind arose so fierce that the top story of the barracks was blown right off. Many of the workers lives were in threat because of this while others were luckily rescued. In addition to work there was no shortage of entertainment. Soldiers, along with the workers, would gather at a club, or at the Mess Hall on the site, to play games, socialize and have a great time. There were special bands such as the 535th Air Force Band that performed at concerts, parades and civic functions in Stephenville and other neighboring communities. Many local bands played for dances and other events as well. "There was certainly no shortage of excitement along with devastating moments," recalls Mr. Howard Janes, the first Canadian to work thirty one years with the American Air Force. The phase out of Pine Tree was apparent by 1960. The change was brought about by the introduction of long-range equipment, and the greater capability of refueling long-range aircraft in the air. Before rising technology took over, laborers were used to the fullest in every area possible. "Radar specialists, firefighters, heavy equipment operators, maintenance men, cooks and helpers all made up the self-sufficient organization." Technology replaced jobs and did the work faster and more efficiently. "Although millions of dollars were spent on labor and equipment to establish a great North American defense organization, today the equipment is redundant." Today all that remains of the Pine Tree site is a lonely dome sitting atop the hill, which can be seen from various vantage points for miles around. Several broadcasting towers and satellite dishes, along with an aircraft beacon used in instrument landing, also occupy the site. However, and more significantly, there remains in the hearts of Pine Tree's surviving workers many unforgettable memories of an era and a lifestyle that seems but a pleasant dream amidst the existing uncertainties of our modern day world.